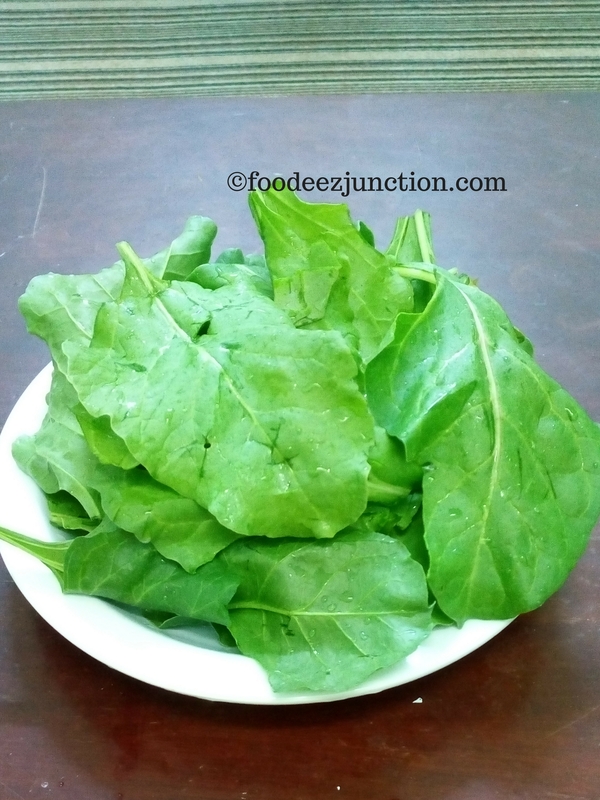 Palak or Spinach is very healthy and nutritious and since Winter season is at doors, we will get a lot of fresh spinach at the veggie markets. I’m sharing one of the best and simple recipes you can make from spinach – Simple Aloo Palak ki Sabzi. The blend of Aloo i.e., potatoes and Palak with the garlicy flavour makes it special. Onion is not at all required in this veggie. You just need to let it cook on a low flame to get the best of the taste from this sabzi. We know very well spinach is very healthy as it contains iron, magnesium,omega-3 fatty acids and vitamins like B, C and E. It’s also advised by doctors to the pregnant ladies. This no-onion Aloo Palak ki sabzi goes well with tur (or Arhar) dal and boiled rice. Or as we call it dal Chawal sabzi, simplified! Simple Indian cuisines are amazing, Isn’t it? Well, this recipe is also for all those cranky kids who complain about onions in their food. My 9-year-old kiddo liked it! Add zeera and chopped garlic cloves, saute till zeera splutters. Add chopped palak and diced aloo followed by salt and green chillies. Sprinkle some water to avoid the sticking of veggies. Cover the lid and let the sabzi cook for 10-12 minutes. Stir in between. Aloo Palak Sabzi is ready! Take a deep pan – a Deep Wok or a kadhai . Heat oil. Add cumin seeds and let it splutter for just 5 seconds. Add chopped garlic and fry till golden brown. Now add chopped palak, aloo, sprinkle some salt and chopped green chillies to the wok. Fry on high flame for a minute. Now add 1/2 tbsp. water to avoid sticking of the veggies in the wok. Cover the lid. No need to add too much water as palak leaves the water during cooking. After 10 minutes open the lid give a nice mix to avoid sticking. Again cover the lid and let it cook further until the potatoes are cooked properly. The sabzi should be dry with no water. 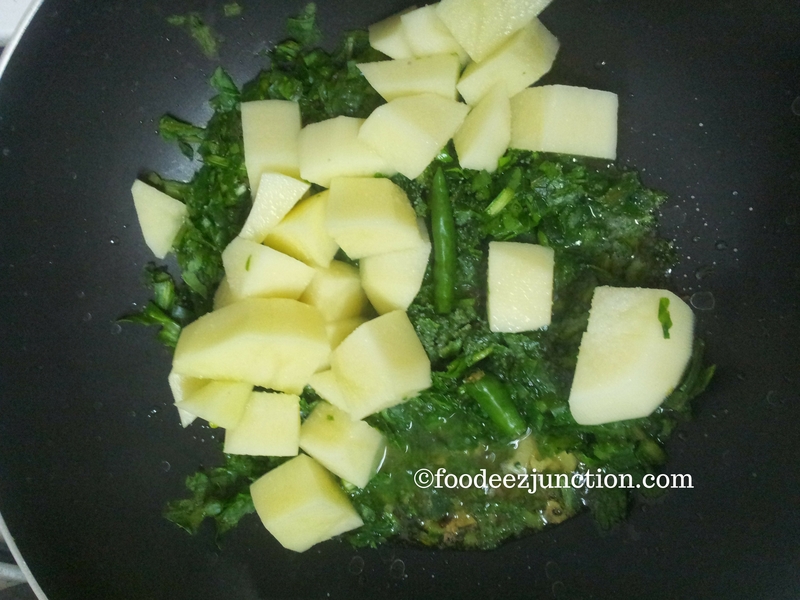 Once the aloo palak sabzi is ready transfer it into the serving dish. Serve hot plain aloo palak ki sabzi with parathas if you are taking in breakfast or with roti, dal and chawal at lunch or dinner. thanks for telling us about this recipe. this is a very common item in north India and one of my favourites. I’m glad you liked the recipe. I like to have this aloo palak sabzi with dal, chawal. Thank you for the recipe, I love cooking recipes especially when the dishes are simple and straightforward. Looking forward to many more if your recipes. I’m glad you liked it. The changing trends in the food industry may have led to fusion foods, there are some of the recipes I’d tried on my own… still it’s the simple food that lure me more 🙂 Hope you like other simple recipe too!